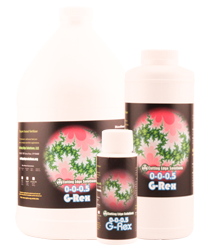 G-Rex is formulated to be used throughout the entire growth cycle. It will continue to work from the rooted cutting stage all the way until harvest. When making cuttings, add G-Rex as soon as callus forms at the base of the cutting. After transplant, continue to use G-Rex in your system at the recommended rate through harvest. G-Rex is compatible with any fertilizer product, however, G-Rex is developed for use with Cutting Edge Solutions Fertilizers. For more information, please visit the manufacturer Cutting Edge Solutions' website. Golden Humic Acid Extract. 16 fl. oz. Happy Frog Rose Food, 4 lbs.